Though not quite up with the market leaders, this GooseVPN review looked at a relatively new Dutch service provider that impressed in a few areas. Although it still lacks in some areas and doesn’t have the most extensive network. Here we’ll get down to the nitty-gritty and see if it’s any good for Australia. No split tunnelling – Support said it is being added. The service doesn’t come with many features built-in which are available as standard in alternatives. However, for an on cost of $0.83 per month you can include Anti-virus Anti-phishing, Anti-malware, and extra firewall protection. With a limited feature set which includes no split-tunnelling either, the firm appears to have concentrated on speeds and unblocking geo-restricted content. With US Netflix being able to be accessed, it was a shock to find they couldn’t unblock Netflix in the UK This isn’t to say it occurs for every user, and is worth checking to make sure. Torrenting is also well supported on their dedicated P2P servers which are placed in countries which aren’t inside any 5-eyes jurisdiction. Goose VPN has 1 package with varying sign-up options. One difference they do offer against many rivals is the chance to sign up for a restricted package. All of the Goose packages are free to try for 30-days, and there is the chance to test the system before you pay. 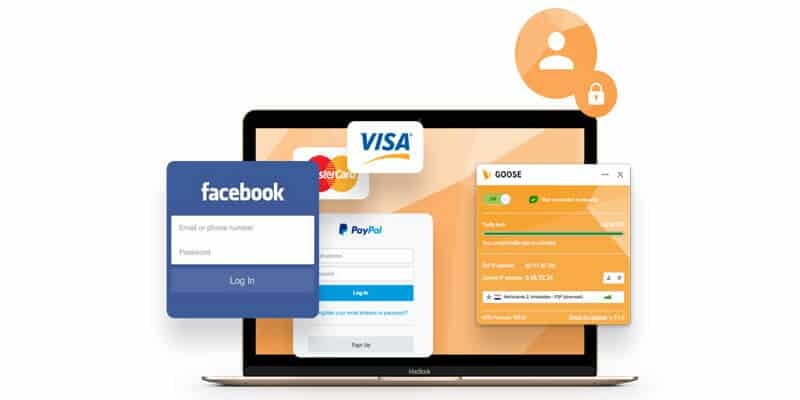 At this point, you do need to enter payment details, so if you are not happy with their product, you need to cancel before your trial VPN 30-days is over. Payments options aren’t the largest, and they accept PayPal, iDeal, Mint (prepaid card for annual subscriptions only) and major credit cards. 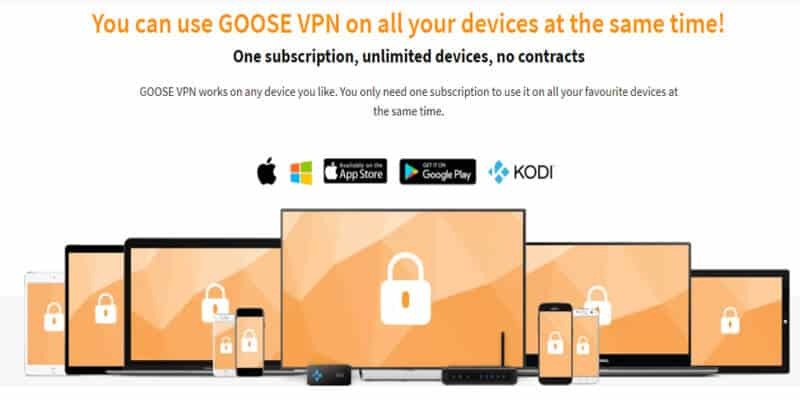 At present, there is no GooseVPN discount code, but, if the service is for you, then 30-day free and a 12-month sign up can be as good as any discount. Goose doesn’t have the most significant server network and has placements in over 30 countries, but this number is increasing. A lot of this is because Goose is quite new, so their network size can only improve. Their servers are split into P2P servers which are placed around Europe, Streaming servers strategically placed for geo-unblocking and the remaining ones with diverse locations. OpenVPN, IKEv2, PPTP, and L2TP/IPSec protocols are on offer, but it depends on the OS you’re using. The defaults are L2TP and IKEv2 which are standard, and OpenVPN might be an option if you are using Windows 10 upward. GooseVPN doesn’t offer a DNS service. Windows, Mac OS, iOS, Android, and various routers. 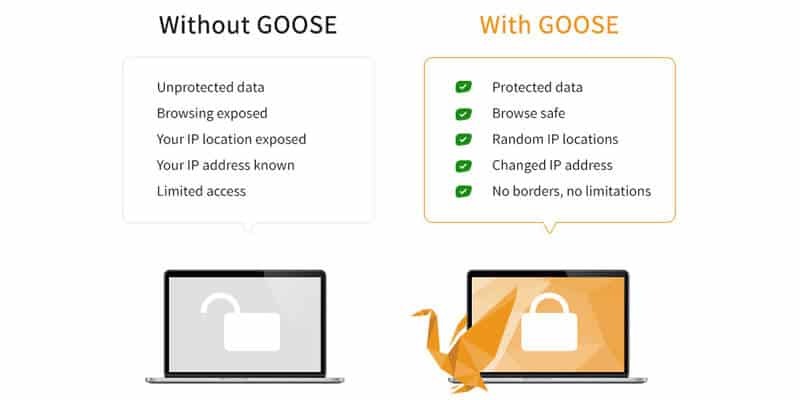 For a new VPN, the breadth of device support is honourable for Goose and is more than some long-running providers. With manual set-up, you can configure the client to run on Linux, Synology, Chrome OS and Raspberry Pi3. The Android and iOS apps are similar to the Windows client in looks and operation. 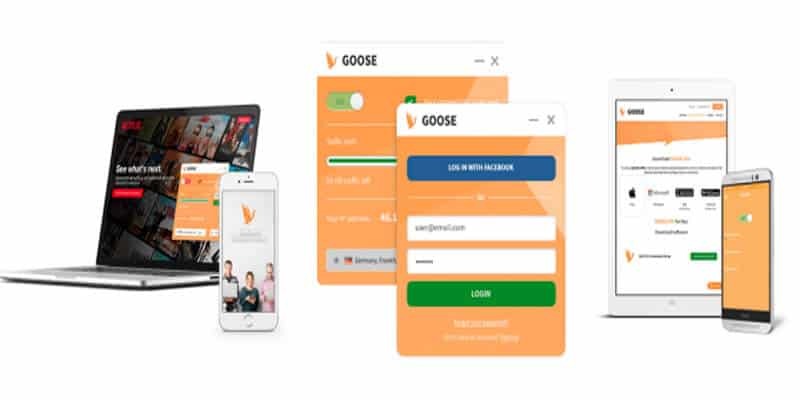 Unlike most other VPN services, Goose allows unlimited connections on your devices. This was double checked with the support staff who confirmed this was correct. However, there is a ban on account sharing, so asking the neighbour to pay half won’t work. The biggest concern was the differing security protocols being used depending on the device and OS being used. But, during testing, there were no DNS leaks. Much of this lock-down is thanks to them using RSA-2048, and although not as strong as others who use RSA-4098 bit keys, it is more than enough to keep you secure. As for logging, the company claims they have a Zero logging policy, as per VPN definition. And while it doesn’t log your IP address when you connect, they do register your IP address when you sign up as a one-time thing. Bandwidth is also recorded during sessions, so it is possible they can trace back to you, bit as the company is based in Holland, they protect privacy, but are under pressure to do something about piracy. After installation, you are taken to the main login interface. Log in, and then you’ll be presented with a large Off Switch. When you click on, you are then taken to an optimal server. In most cases for privacy, this is enough, but if you are looking at US Netflix or torrenting, you would need to switch router to one of the dedicated ones. This is quickly done from the server drop-down menu. At the same time, you might change the protocol to OpenVPN if it isn’t enabled. As standard, there are not many advanced features. The ones which are available come with the small monthly charge as mentioned. In the client, you do have the option to auto-connect, disable the smart server list and enable the kill switch. It would be good if this were enabled by default. One feature they do have is, they can be integrated into Kodi. This though might not be much use if you are looking to protect the entire device connection rather than one app. Goose at present only offers a browser extension for Google Chrome. This is almost identical to the Windows client in looks and operation as well as their other mobile apps. With a small network, it was a surprise that Goose’s speeds ran at around 50 to 75% of unprotected speeds. This could be one of the firm’s most significant selling points. However, the ping wasn’t the quickest, so, for online gamers, it might not be an ideal scenario. Customer service is excellent, and this is a change in an industry which is well known for not fully supporting their customers. Goose has 24/7 365 support which is responded to within 3-hours regardless of the question. For general inquiries, they responded via the live chat in seconds, however technical ability at this level is limited. Compared too many other VPN’s on the market. Goose does offer a viable alternative to many who are placed inside the top 10. In some ways, you can see they have mirrored the best VPN for Australia. Express VPN, but for full features they lack, and with a price which isn’t marginally different. At present, with the feature set and network size they have, with the Netflix unblocker, they are worth checking out for the first month. If you are a light user of streaming and can cope with the limited data package, you can still download movie torrents on the odd occasion and not reach your limit. For a family though, it would take the full package to benefit, but then you are hit by what they don’t offer. A good option, and better than many, although you might find the service lacking for heavy use.